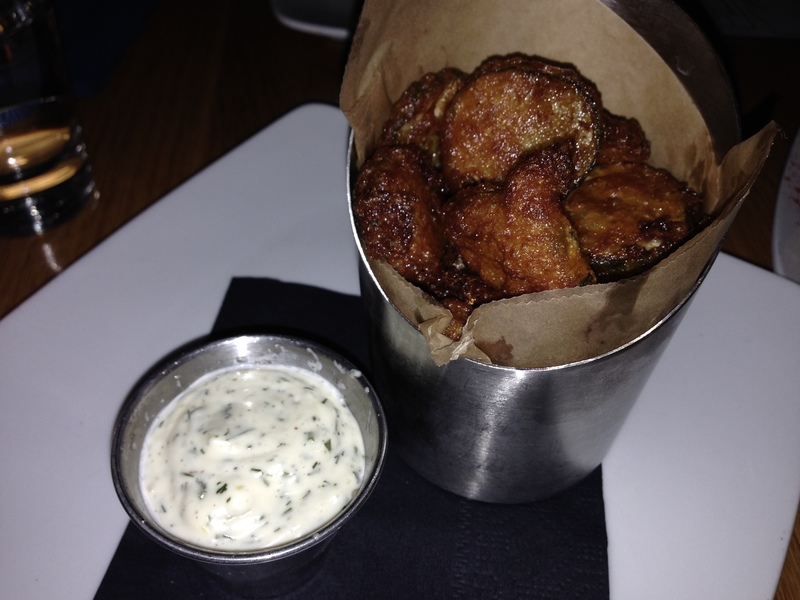 One Madison restaurant that I took way too long to try out is Coopers Tavern. 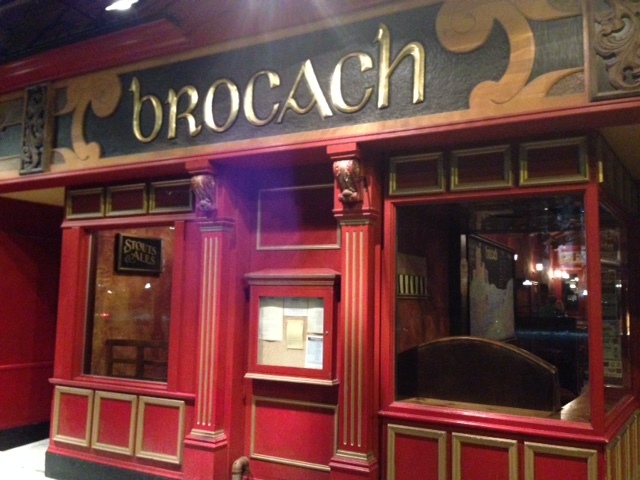 It’s near the top of State Street on the Capitol Square and has a super tiny dining room with a long bar on one side. It was busy the Friday night I went with a friend, and we had to wait basically inches from people already eating. 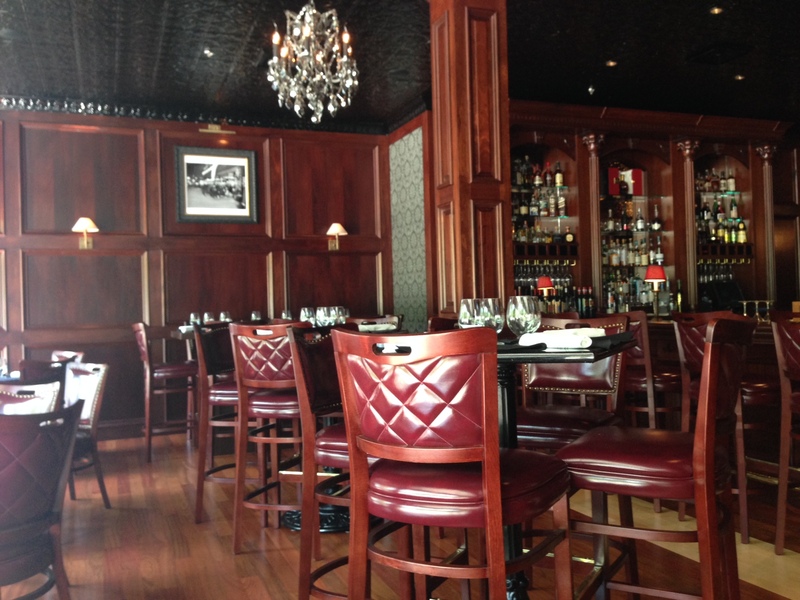 Once we were seated the cramped dining room issues continued…I had to hook my purse on my knees and I was awkwardly bumped by two people who were hovering around the bar waiting for a table. 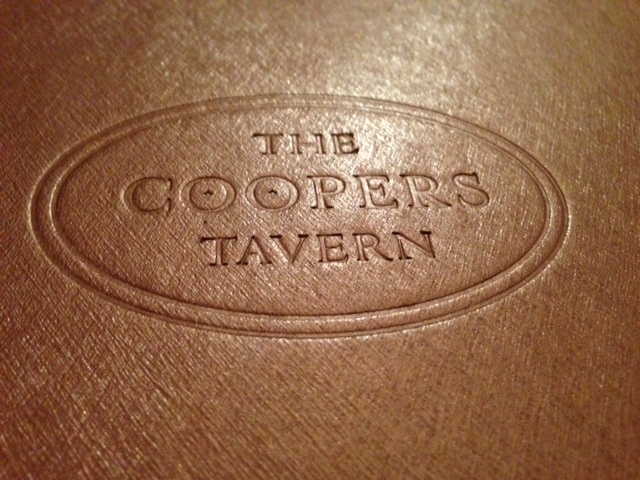 Despite the super tight quarters the atmosphere at Coopers Tavern is rustic and welcoming. I’m not a big drinker, but I do love a good gluten-free cider and Coopers Tavern has the largest selection of ciders I’ve seen. 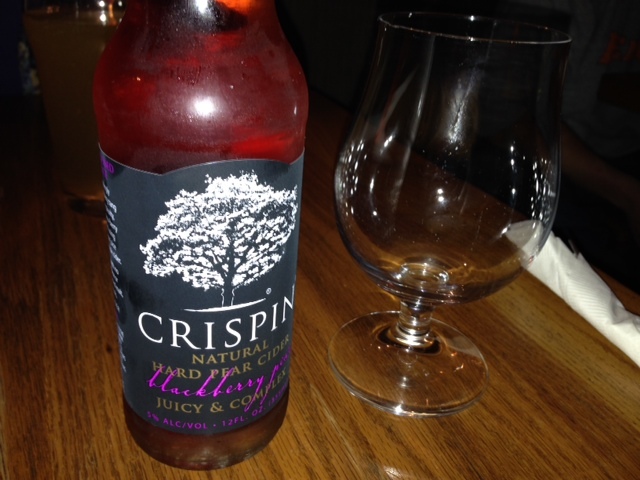 The Crispin blackberry and pear cider was light and refreshing. I could really taste the pear flavor, and even though the blackberry flavor was pretty much non-existent I still really liked it. 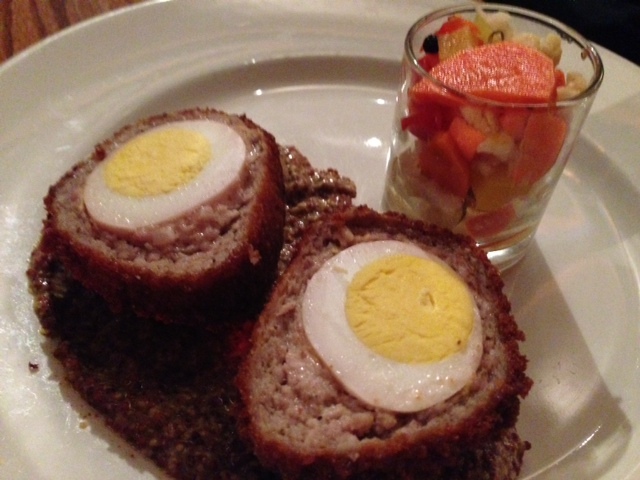 We started with Coopers Tavern’s version of a scotch egg, the Sconnie egg. The Sconnie egg is a hard boiled egg wrapped in a Knoche’s market brat patty and fried. 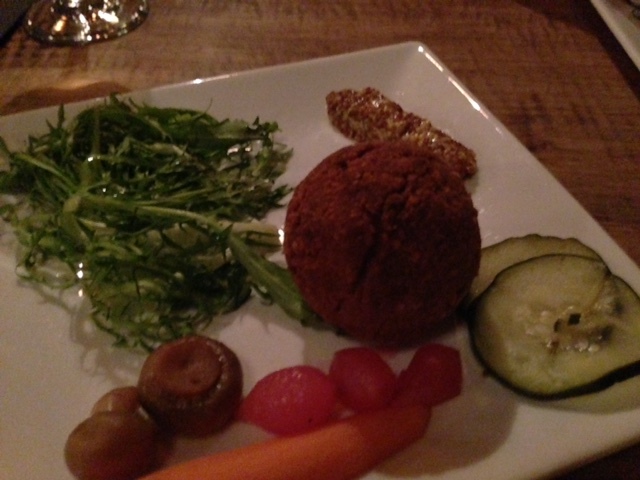 It is served with pickled vegetables and stout mustard. 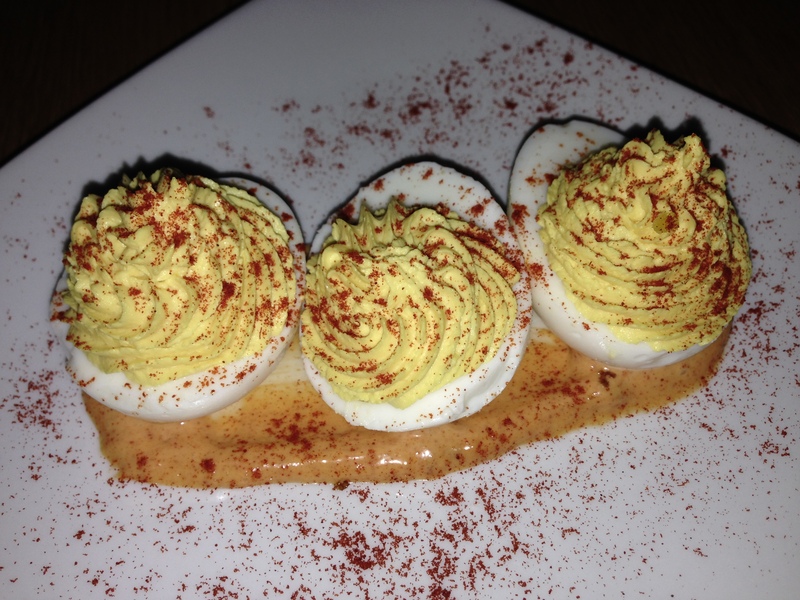 The Sconnie egg looks a little odd, but it tastes great. The hard boiled egg and the brat taste like breakfast and then they fry it…frying makes everything better! It’s a pretty heavy flavor profile, so the spicy, seedy mustard really adds a much-needed tang. 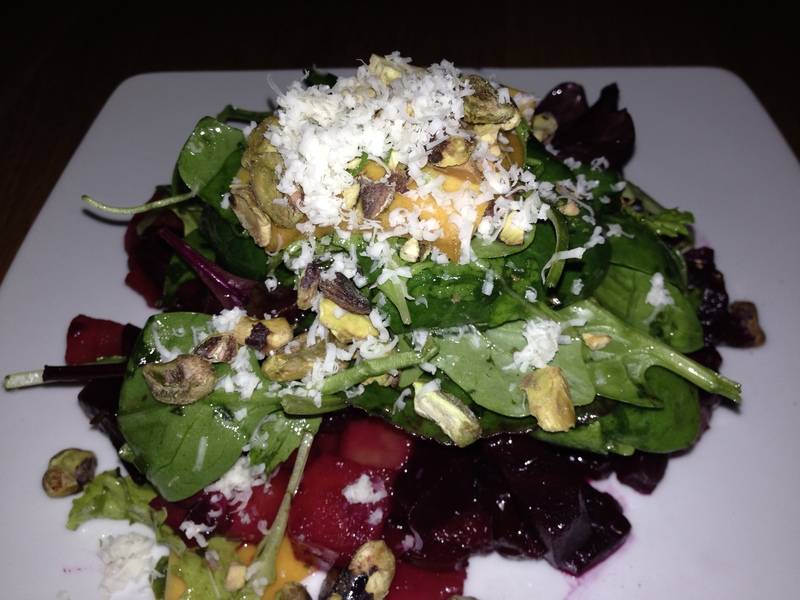 I was really excited about the pickled vegetables, but they ended up not being good. They were pickled with anise and other warm spices, and I really didn’t like those flavors. I got the steak and frites as my entree. 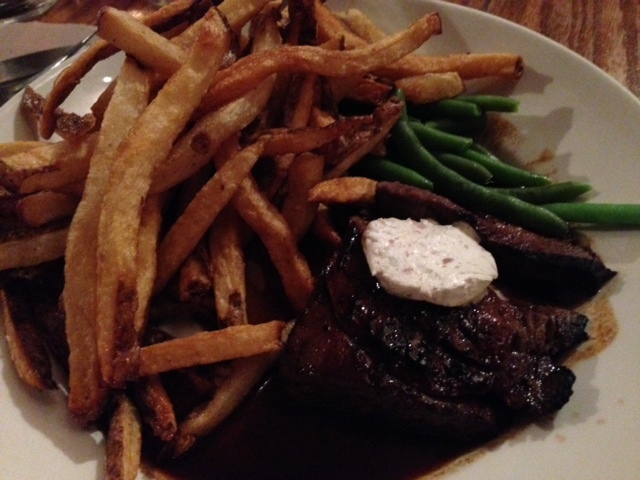 The marinated flank steak came served with blue cheese bone marrow butter, a homemade bourbon steak sauce, green beans and Belgian frites. The steak was crispy on the outside and tender on the inside, but it was a pretty small portion for the price ($16.95). The bourbon steak sauce tasted pretty much like pre-packaged barbecue sauce, and even though it was good I was expecting it to be better. The fancy bone marrow butter didn’t taste as special as the description made it sound. The simple steamed green beans would have been better with some seasoning. 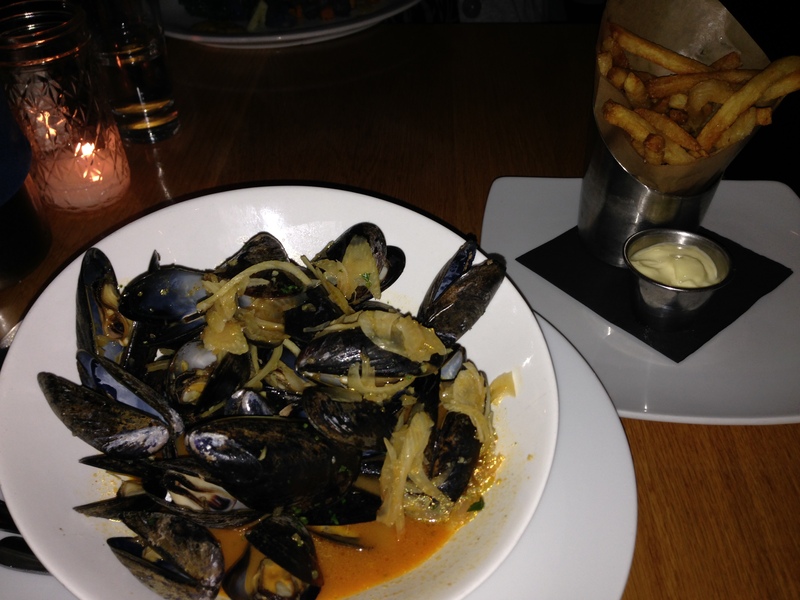 The frites were classic frites — they were salted perfectly and fried to a crisp. My friend got the pork belly mac. The dubliner cheddar mac and cheese comes topped with Madison Sourdough bread crumbs and Guinness stout glazed berkshire pork belly. The sauce isn’t like traditional cheese sauce. It tasted like a fancier version of alfredo sauce. The glaze on the pork belly was sweet and tasted like it had brown sugar in it. FOOD NOTES: Coopers Tavern has an extremely small dinning room that definitely makes waiting for your table that much more annoying. 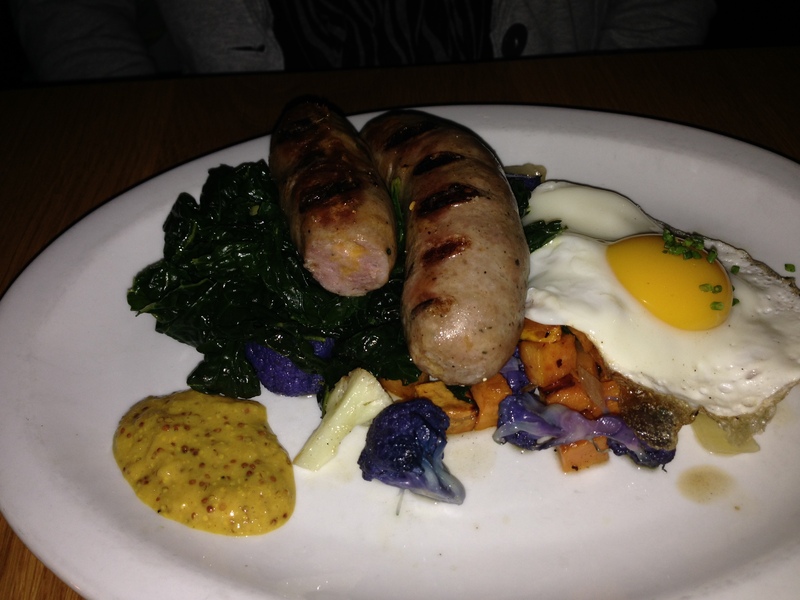 The gluten-free cider menu is a nice alternative to beer, and I loved the Sconnie egg. My steak and frites were good, but a little on the pricey side. The green beans were generic and the sauce on the steak had a pre-packaged quality to it, but the frites were perfectly crispy and salty. 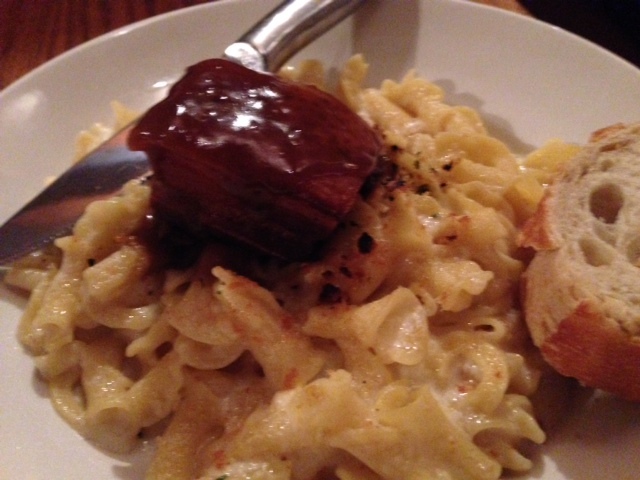 The pork belly mac was a little different than traditional mac and cheese, but it was good. The cider options and Sconnie egg will bring me back, but I will probably get a different entree. I love steakhouses, and expect them to serve up tasty dishes, big servings, classic options and above all, be able to cook a perfect medium rare steak. 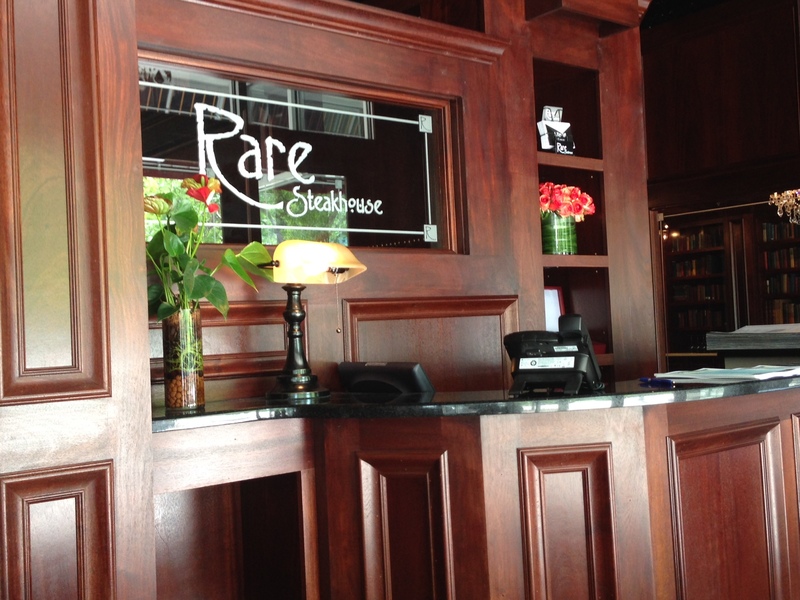 Rare Steakhouse is right on the Capitol Square and opened just a couple weeks before Madison Magazine’s summer Restaurant Week. Unfortunately, I don’t think those three weeks gave Rare enough time to perfect the art of cooking a medium rare steak. Their appetizers for the Restaurant Week menu were definitely not classic steakhouse appetizers.We chose the smokey popcorn and the smoked salmon nachos. 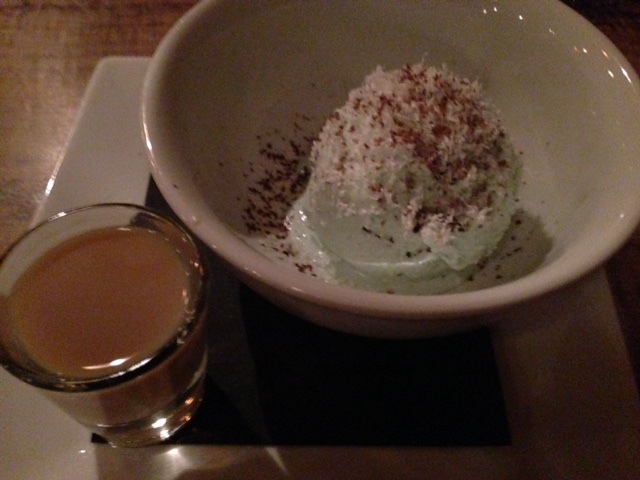 We decided not to get the oyster shooter (served bloody Mary style). 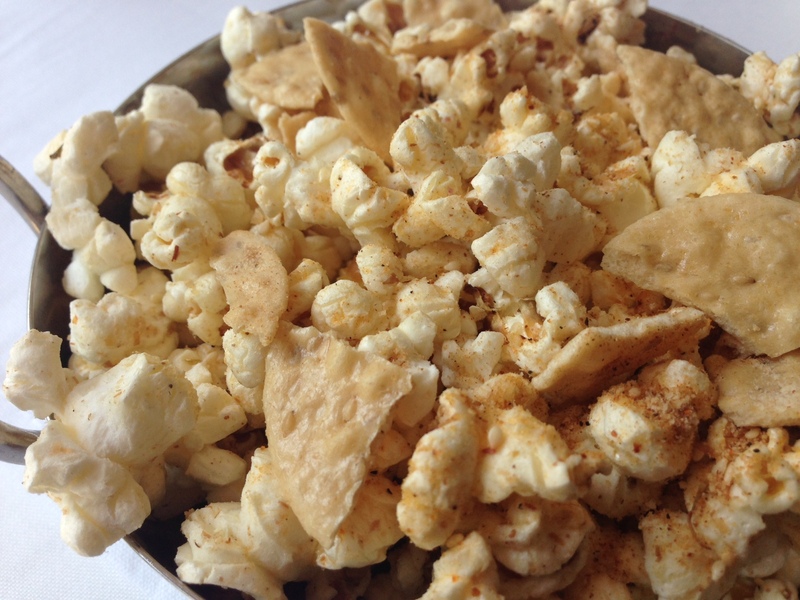 The smokey popcorn was supposed to have smoked paprika on it, but it tasted like slightly salted buttered popcorn. It was good, but not what the menu promised. The smoked salmon nachos was a confusing dish. 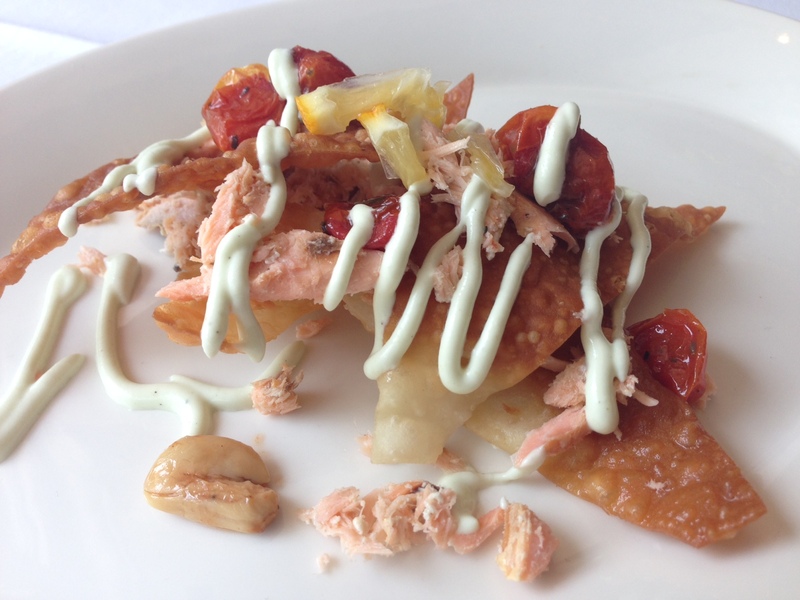 It had wontons, smoked salmon, confit tomatoes and wasabi cream sauce. 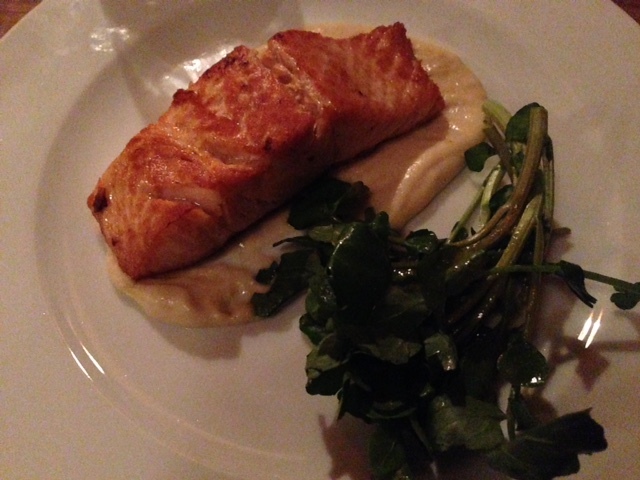 The salmon was mushy and the wasabi cream sauce didn’t have any wasabi kick. The individual components of the dish were really not great separately, but when I finally got a bite of all four components together it was pretty good. The bad news is that there wasn’t enough salmon or tomatoes to get some in each bite. For entrees there really is only one choice at a steakhouse – the top sirloin. 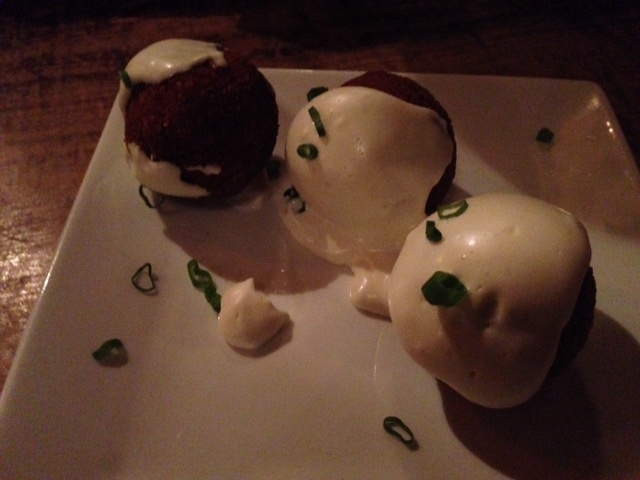 During restaurant week they also offered gnocchi and beef sliders. My mom and I would have tried the gnocchi if it had said they were homemade on the menu, but we didn’t find that out until after we had ordered, so we both got the top sirloin with potatoes, asparagus and a demi sauce. We both ordered our steak medium rare and mine came out unevenly cooked. 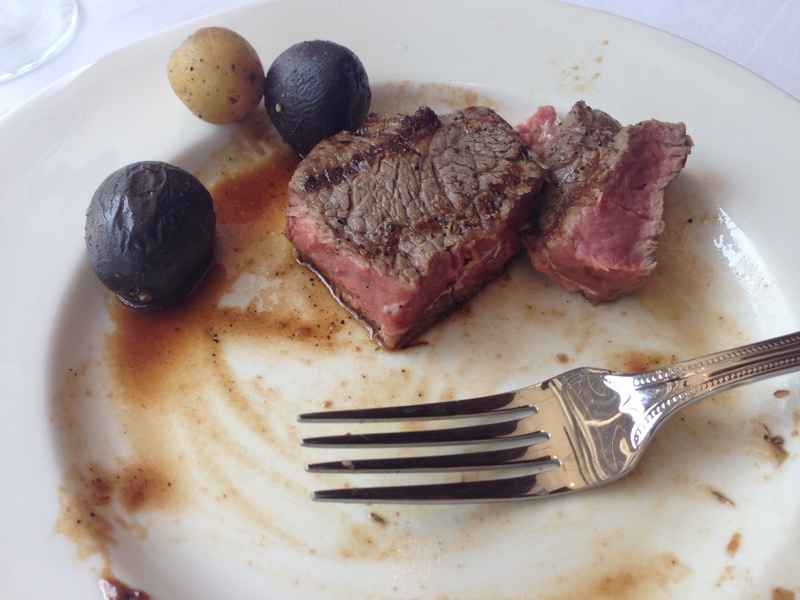 Part of it was medium and the other part was medium well…neither half of the steak was anywhere near medium rare. The steak had an interesting rub on it that had a little bit of a citrus flavor. I didn’t love it or hate it. I did hate that my steak was so tough I felt like I was chewing beef jerky. My mom’s steak was also unevenly cooked, but it was closer to medium rare than mine. 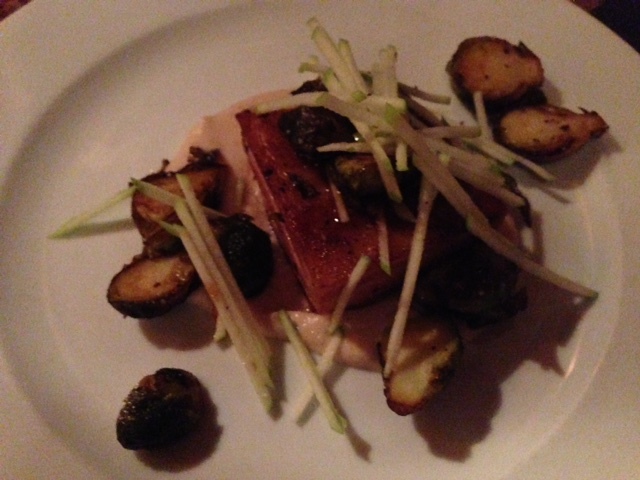 The potatoes were tender and salted well, and the asparagus was al dente with a savory, not overwhelming sauce. For dessert we got to choose between creme brulee, profiteroles and chocolate cake. I got the chocolate cake, which was super tiny. 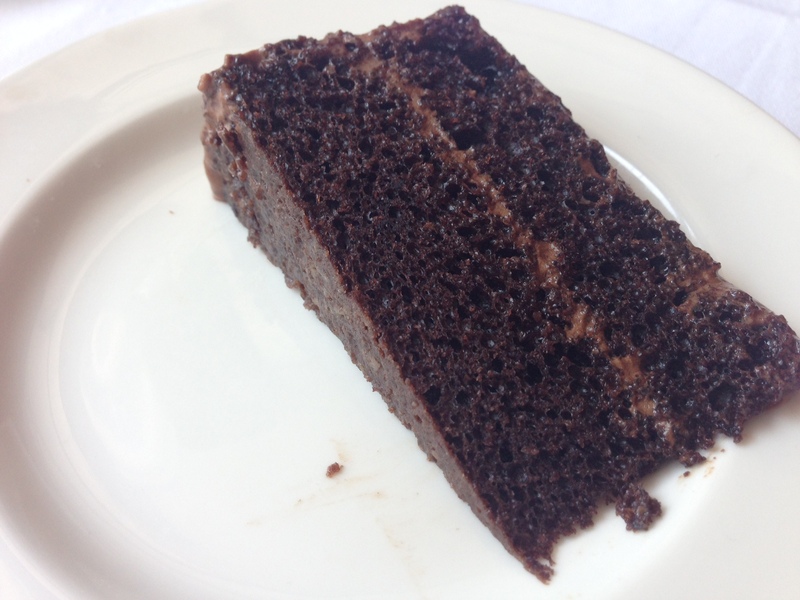 It was moist and not too sweet, but nothing better than a typical chocolate cake. My mom got the creme brulee, which ended up being the highlight of the meal. The flavor of the day was hibiscus with vanilla bean. 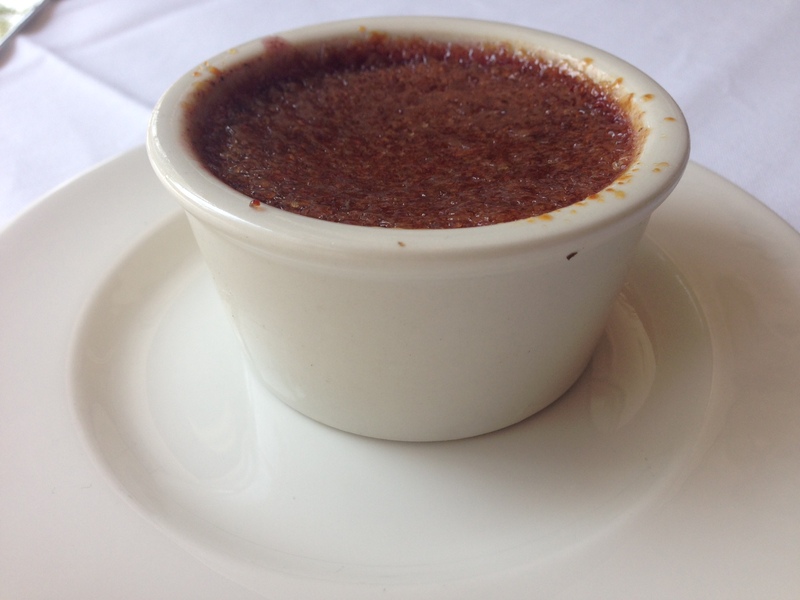 The creme brulee custard was a vibrant purple color, and it had a great flavor that was sweet but also slightly tangy. It was the most uniquely flavored creme brulee I’ve ever had. The one thing that Rare did really well was their atmosphere. The restaurant is broken into a couple different dining rooms – a bar area, an area with big leather booths and the library. 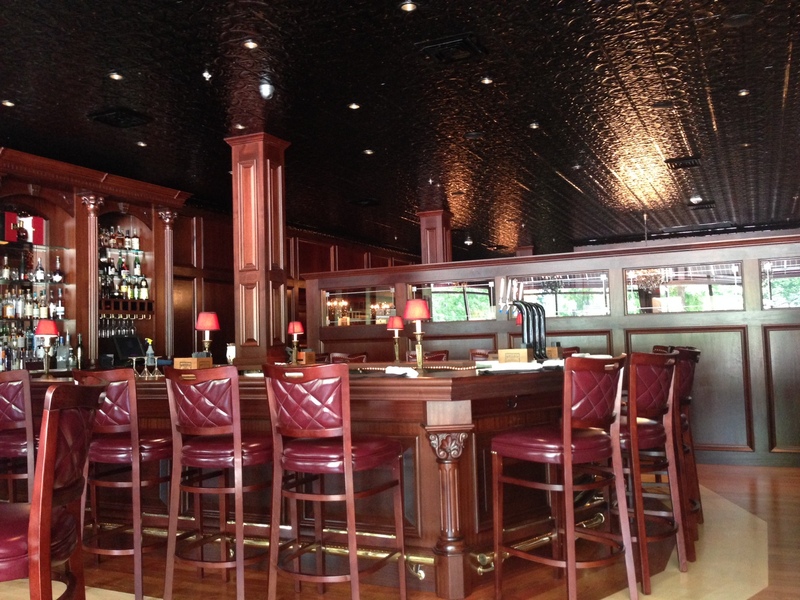 The bar area features dark wood, shiny chandeliers and black tin ceilings. The library is an elegantly lit room with big comfy chairs. The one annoying thing about the atmosphere was the service. The servers are extremely attentive, almost to a detriment, and they make what seems like too much of an effort to have in-depth conversations with you. FOOD NOTES: I thought the quality of the appetizers at Rare could have been better, and I was also extremely disappointed about their ability to correctly cook a medium rare steak. The most important part of being a steakhouse is to be able to correctly cook a steak to order…and Rare failed twice during my Restaurant Week visit. The sides were typical, and the chocolate cake was standard. 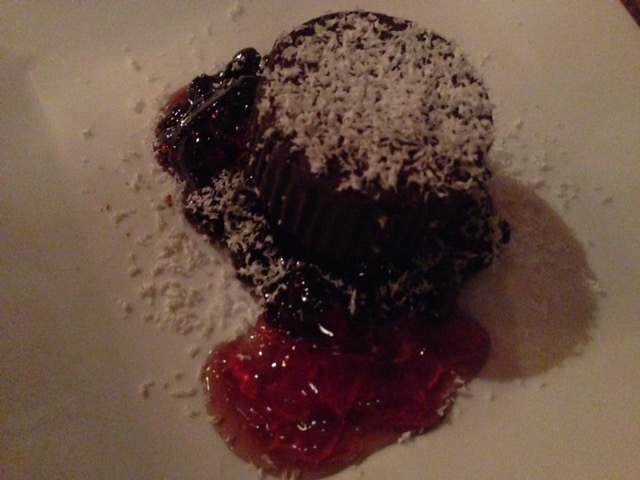 The best part of the meal was the unexpected flavor and quality of the hibiscus creme brulee. Based on the high prices on their regular menu, I won’t be going back for a while. Hopefully their kitchen will learn how to properly cook a steak, and even if they do I’m not sure the meal and experience would be worth the money.